I’ve known Elijah for a while. He, when I was in, with the Lakers [in 2011], he was in our training camp. Did a really good job, and then played with the D-Fenders that season. So, I’ve been familiar with him for some time…I think, you know, he’s got a tough defensive mindset. That’s not to diminish him as an offensive player, but as far as our team, I think that’s a, you know, something that we need, and you know, something that he can bring…He played against us this summer, and did a really good job guarding Dante [Exum]. Well, he’s continued to get better. I think the biggest thing for Rudy is not to be satisfied with whatever improvement that he’s made, and you know, I’ve been on him pretty vocally about that, that I’d like to see that this continue. And playing tonight against, you know, probably the best defensive center in the league, if not, you know, right there, is gonna be a real challenge for him, and one I’m sure he’s, you know, he’s looking forward to. But looking forward to it and being prepared for it are two different things, so hopefully it’ll be a good matchup and a good chance for him. I think we just more committed and the communication got much more better. * First play in this video. I think it just give me confidence when I block shots, and I just feel better every time I block a shot. Right now, I’m just a player. You know, I just wanna play defense. Get up and down the court, you know? [If] my opportunity’s there to score, score. But right now, just play defense and play hard. Actually, [Paul] was the first one [to break the news]. So, [Quin] reached out to him first, and [Paul] did something kinda crazy, joke, trying to make me scared…It was funny and I won’t disclose what it was right now, but he’s a character…He always made me work for things, but he’s my biggest supporter, and I appreciate him for that, so. Jan. 3. That’s when I got the call. It was good. I remember Quin for his offensive mind. You know, he’s a great one-on-one, you know, offensive player, so, far as skill work and developing guys. So I appreciate him, and staying after with me when I was in L.A., and giving me this opportunity. 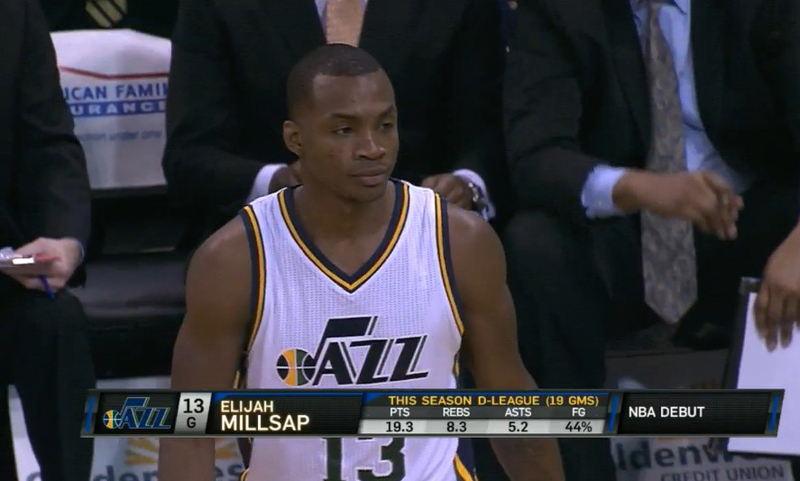 Welcome to the Jazz, Elijah Millsap…though I have to say, it doesn’t really sit right with me to see someone else wearing No. 13. Derrick [Favors] really gave us a lot tonight…I mean, that’s a hard team to play against, with their size and their toughness. And I thought our guys showed, you know, a lot of resolve and a little bit of toughness, maybe, that I haven’t seen up to this point. There was a little edge that I liked and I hope we see more of. I’m proud of him for hanging in there [after starting the game 0-5 from the floor]. I think a lot of guys would have just stopped shooting. And he didn’t do that, so. I thought he defended, and I was proud of him. I’ve got confidence in Joe, and in his floor game. You know, I think he’s, plays with a lot of poise. His presence offensively really settled us at times, especially when Gordon was out of the game. He handled the ball a lot, and makes really good decisions. I like the fact that he, there was more moxie in his game defensively and on the boards, and that to me is a huge thing for him, you know, for him to play with an edge like that, you know, defensively. And I saw more of that tonight, so I was happy about that. More so than his offense; I know he can play offense. I think it was just a tale we couldn’t make a shot, and they were hitting everything. I mean, we co–we still communicating out there. I think we were just being a little over-aggressive on the help. Instead of letting guys in the pick and roll or whatever deal with it, we, I think we were being a little too over-aggressive in helping off shooters instead of helping off non-shooters. Just focus. You know, the biggest thing, I think, is communication. I’m just taking what’s given to me. I’m not trying to force anything. So whatever’s given to me, I’ll take it. The thing I kept hearing was, “Keep shooting. Keep shooting. Keep shooting your shot.” And you know, when you start off shooting 0-for-5, that’s not, that’s the last thing you want to hear. Actually, no, it’s the first thing you want to hear, but you know, I was just trying to find, you know, my game, and luckily I started off the second half [shooting better]. So it was nice that he had the confidence in me to shoot that shot. You know, not getting any assists as starting point guard is, you know, it’s not good enough. So you know, it’s something I just need to work on, and hopefully when I get the chance again, I can, you know, step up. I think I’m doing pretty well. It’s, I’m trying to lead in other areas. Communication isn’t one of my strong areas, but I’m getting there. You know, Quin has talked a lot about, just, it doesn’t matter that I’m 19, just to kind of step up and you know, take on that role. So, yeah, it’s just, it’s a work in progress. … I think there were a couple times when I went a bit quiet when we got a bit down, and that’s the time I need to be as vocal as I can. The whole second half was a, I think it was a whole ‘nother team, really. We were talking and we were more into it. And guys were getting down and dirty with the offensive sets that they were running. We wouldn’t let them screen; we wouldn’t let them get to where they wanted to go. And yeah, I mean, that last few minutes where we executed really well, and got the looks we wanted, really…Like I said, really proud to play with the guys, and we, yeah, the execution down the stretch was great for the future. I think we’ve just got generally quiet guys, which isn’t, obviously, a bad thing in real-life situations. But once you cross that line, you’ve gotta kind of jump out of your skin a little bit. And yeah, it’s a work in progress. We have got better at it, but there’s still a long way to go and when we are talking and communicating, it’s a huge difference. It just makes us a whole ‘nother team. 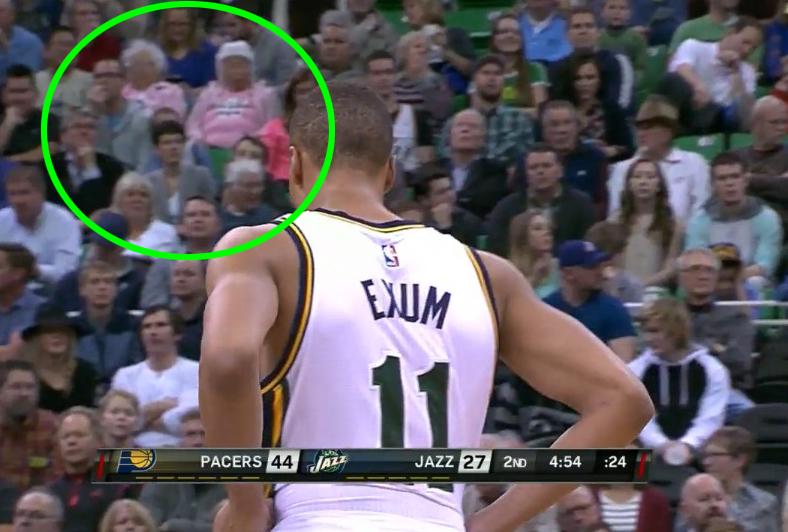 ** In the house: Jerry Sloan and the pink grandmas. ** Media member to Quin Snyder, shootaround: As a coach, is it tough when you get these guys going down? Snyder: If it’s an opportunity right now for other guys to, you know, to get experience, and for us to find out about them, and learn and maybe get deeper over the process, that’s a good thing. And it’s obviously hard in the short run. ** Snyder on Enes Kanter’s ankle: It’s, you know, it’s been pretty swollen. ** Craig Bolerjack: Favors tries to saddle Hibbert, and he gives it off to West. ** Matt Harpring: You got a bunch of mashed potatoes out there, and all of a sudden Ingles comes up with some gravy off the rim. Harpring: I don’t want to ski. I just want to ride the tram. Boler: OK, we’ll make that happen for you. ** Harpring: You can’t allow Hibbert to get this deep. Watch him seal Gobert so deep. Once you put a 275-pound body this deep, it’s just too low and then the up-and-under. Now, Gobert relies on his length a little bit too much at times. ** Harpring on Rodney Stuckey: Watch Big Joe get his hands on it. And now he’s in trouble. Here comes Gordon. ** Harpring on the telestrator, Part 2: There goes my bad circle again. Boler: You know, I want you to work on that before we get to Chicago. Please. ** Boler: Hayward with the quick reach-in, and that’s gonna put C.J. Watson at the line. ** Dante Exum on having zero assists: It was a big thing, and I found a couple guys a few times. ** Steve Brown to Trevor Booker, post-game: You guys have proven you can hold your own on the road, which is kind of surprising to a lot of viewers when they look at how young this team is and that you’re under a new coach. I will always have a soft spot in my heart for Phil Johnson. 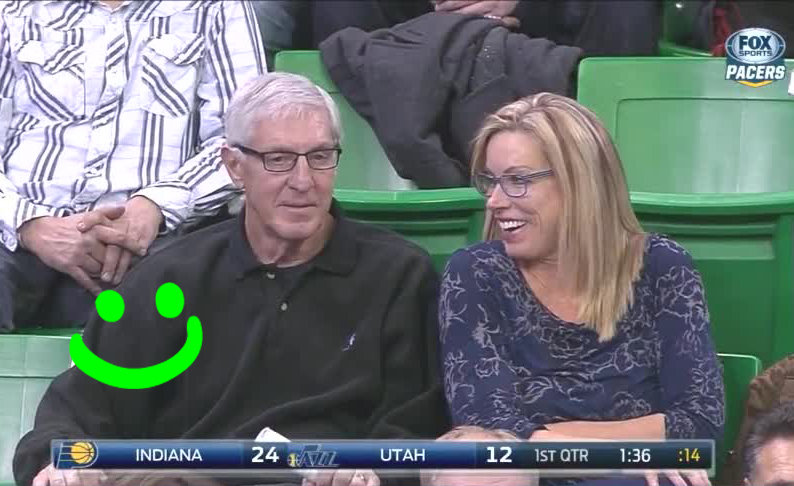 Any guy Jerry Sloan has an assistant for 23 years is okay by me. This interview is one of his better ones.